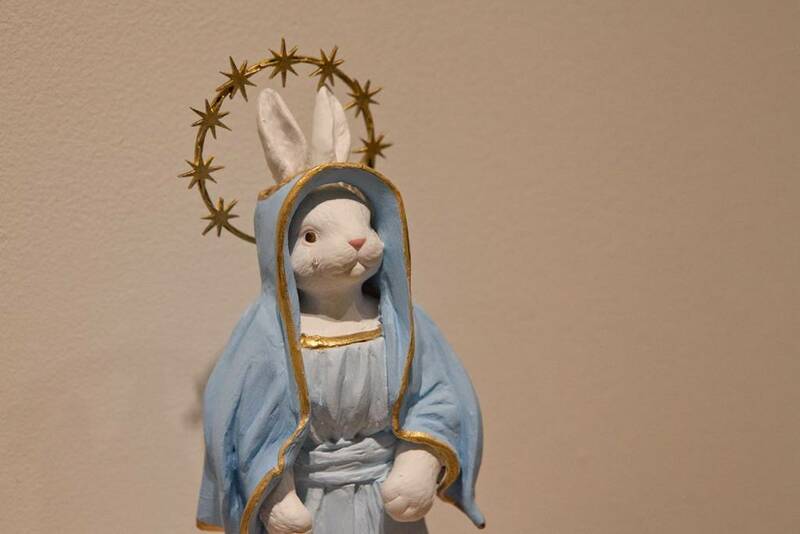 Made in Champaign, the latest two person exhibition at Figure One downtown, presents the results of the University of Illinois affiliated gallery’s summer artist’s residency. A conceptually dense proposition, the wide-ranging works by participants Maria Lux and Jason Patterson dance a tenuous duet, highlighting each other’s strengths and occasionally underscoring their weaknesses. Lux, a 2012 graduate of Illinois’s MFA program, presents a panoply of styles and objects that comprise an installation driven approach to art-making. In her wall-spanning tableaux “Like Clocks,” the artist quotes film (A Clockwork Orange), art history (take your pick of any number of 1960s conceptualists), and literary sources ranging from Jonathan Safran Foer to Voltaire, to deliver a stinging critique of man’s historic mistreatment of animals. Beginning with a sinister rendering of Rene Descartes, “Like Clocks” excoriates the philosopher for his role in advocating a mechanistic view of animal behavior. Unlike humans, who by virtue of reason and language act in ways not solely governed by biological stimuli, Descartes believed that animals merely constituted a complex kind of organic machine. Thus, in his view, our responsibility to them was essentially nil. Lux explores the troubling legacy of this theory through a dramatically varied approach to media. An ink drawing of Pavlov’s dog shares the wall with snippets of text, bottles of “tears,” and a 1930s console radio repurposed to display film clips from Bambi, the aforementioned A Clockwork Orange, and Pavlov’s experiments. Farther down, a depiction of a cow being perpetually milked and an anthropomorphized ceramic rabbit further attest to the ways we’ve used and abused our furry friends. Undoubtedly “Like Clocks'” multifarious rumination on animal welfare is earnestly felt, but taken in conjunction with the clinical — and oddly humorous visual investigation of animal hording — “Doghouse, Dollhouse” — the pieces don’t deliver the visceral response that seems to be motivating them. To varying degrees, these works fall prey to the notion that visual art and the creative process constitute a kind of “research activity.” I’m not convinced that they do. At least not in the sense that art will someday cure a disease, stop a war, or doing anything significant in particular. This methodology, which elevates an intellectual relationship with the world over a sensual one, can yield visually bereft works coupled with dissertation-length artist statements. But as the sumptuously cute “Ad Astra” and heart-tugging “On Domestication” make plain, Lux has a remarkable facility for luscious painting and fine draftsmanship. The sensuousness and sheer physicality of these two pictures stand in stark contrast to the more cerebral installations. Jason Patterson’s three contributions to Made in Champaign are materially more focused. The artist’s large-size recreations of 19th century tin-types featuring free African Americans have their antecedents in German painter Gerhard Richter’s figurative works. These pastel on canvas pieces are dark and brooding affairs, with deep blue and burgundy wisps darting around proud but pensive figures. Patterson’s slick surfaces are littered with flecks of white pastel that have been dragged across the canvas, imparting an eerie scrim that veils these historic images. History, and our awareness of it, is the primary element at play in these works. 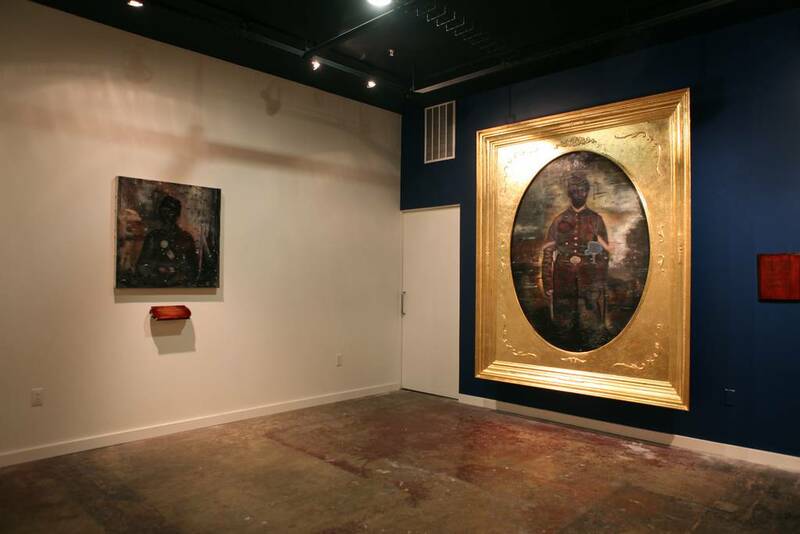 The massive gold leaf frame that encloses the rendering of an "Unidentified African American soldier in Union uniform standing next to chair with bayonet, c.a, 1863–65" evokes the grand scale frequently associated with neo-classical history painting. But to what end? Patterson’s work sets about uncovering elements of black cultural heritage, elevating them, and bringing them into the present moment. When the viewer casts his gaze upon the artist’s robust drawing after a “Three quarter length portrait, young black woman seated, wearing a summer dress” he is simultaneously aware of its status as a historical artifact and its presence as contemporary image. These works share the conceptualized relationship to art-making found in Lux’s installations, but the consistent materiality and establishment of illusory space is an efficient disguise. Patterson’s lovely drawings effectively transport the viewer to another time and place, but we’re not sure how to feel when we get there. Through the work of these two gifted artists, Made in Champaign reveals current trends in contemporary practice that emphasize media citation and cross-disciplinary inquiry. While Maria Lux and Jason Patterson propose different methods of materially resolving their investigations, they’re united by an understanding of art-making that, for good or ill, holds the idea as central tenant. Made in Champaign is on display through October 13 at Figure One.